Rich and flavorful, beans are fiber packed veggies that promote digestive health. They are high in antioxidants. They also are nitrogen fixing legumes which bring in nitrogen from the air and load it into the soil for future crops. Available in four packs. All plants are certified organic. Select here for transplant information, pick up and order dates. Early variety with lemon yellow pods with green tips are round, straight and tender. Fine flavor and crisp texture ideal for pickling. Easy to pick. The standard variety when you think of green beans. 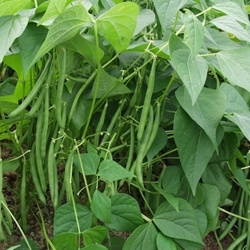 Plants yield attractive uniform beans. Good resistance to powdery mildew.